After the washing and drying process the combing process removes the remaining vegetable matter and shorter and irregular sized fibres. This transforms the mohair into a soft mohair "top". Some of the mohair gets shipped off to buyers around the world while others move through the next process of spinning the yarns. After the combing process the mohair that is due to be shipped off gets tied in bundles and packed in small bales. This guy was busy tying the bundles and I was very impressed with the way he was handling that big "needle" in his hand. 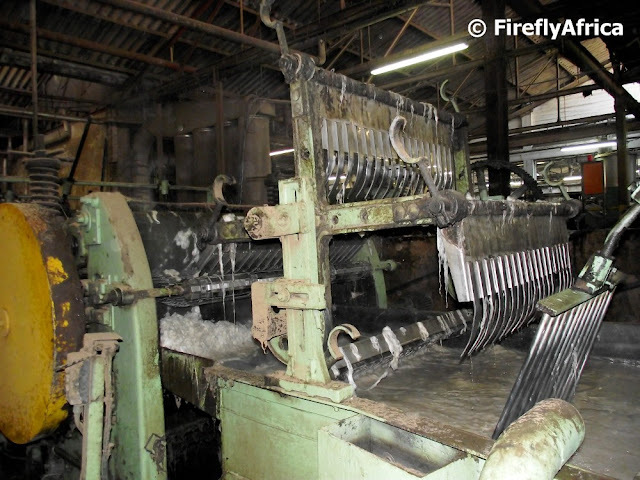 After the mohair has gone through the washing process it gets dried through blowers. During the wash and dry process the mohair went from being dirty and oily to white and fluffy, looking very mush like cotton wool. 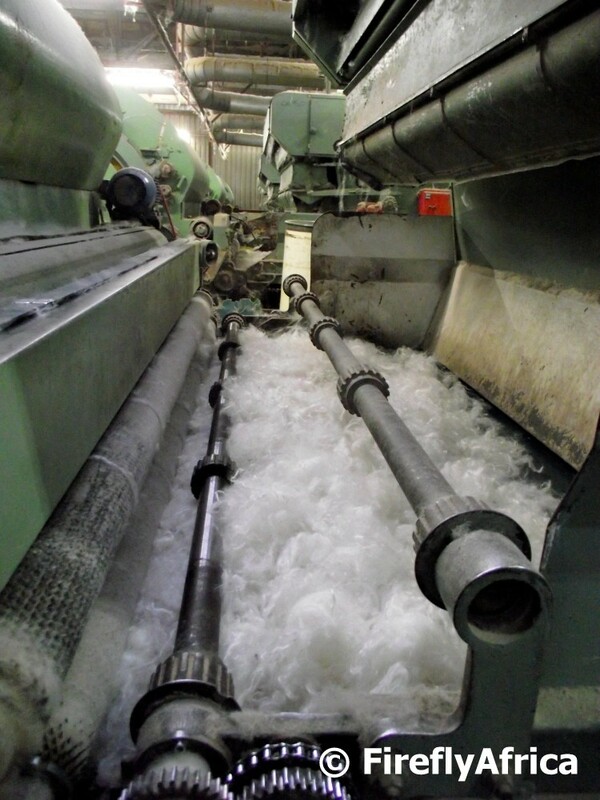 Here after the mohair fibres are positioned in uniform lengths and most of the remaining vegetable matter gets removed. A sliver or coil of mohair called a "carded sliver" is then produced. Angora goats are sheared twice a year and doesn't get harmed in any way during the process. The Angora goats thrive in the Karoo with its combination of hot, dry summers, cold winters (although they don't always like freezing cold snaps) and semi-desert vegetation. 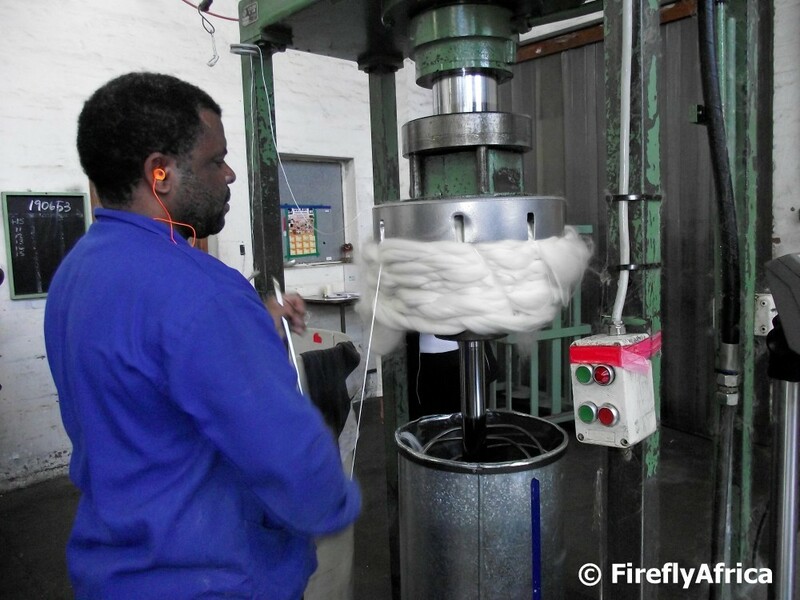 The South African mohair industry is set apart from some of its counterparts through best practice farming as well as the perfect environment. The washing, or scouring, process of the mohair is straight forward yet seemingly very complicated. The machine doing the washing looks like a bunch of spider or crab legs combing the mohair through the water before it gets blown dry. The reason for the washing is to remove all excess dirt and oils. 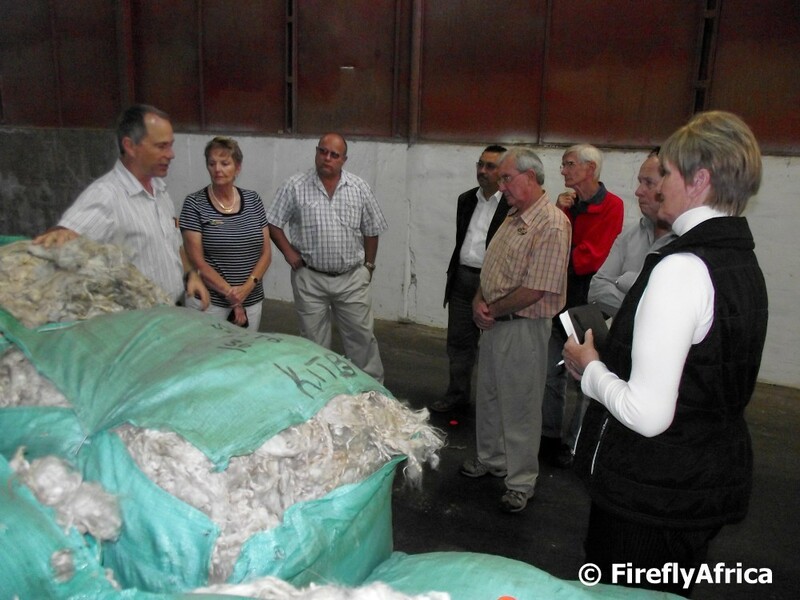 The founding of the mohair industry in South Africa came by a stroke of good fortune. A farmer ordered Angora goats from Turkey in 1838 to try and establish a mohair farm. The Sultan of Turkey wasn't willing create competition for their own mohair industry and sent 12 infertile rams and one ewe to the farmer. Unknown to the Sultan the ewe was pregnant and gave birth to a kid ram. This established the Angora breeding stock in South Africa. 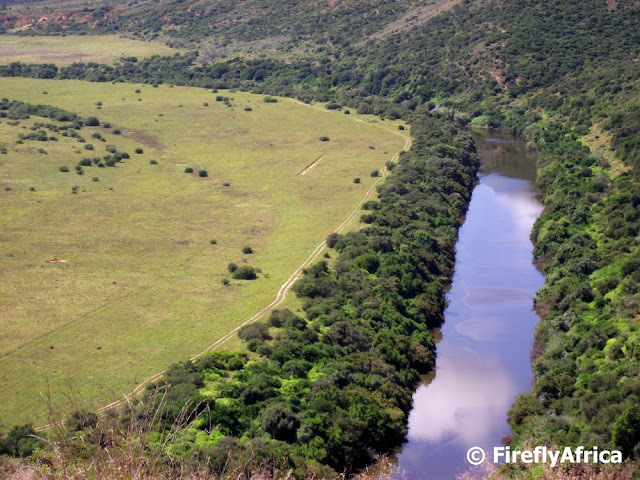 The animals ultimately found their way into the Karoo region of the Eastern Cape where the mohair industry thrives today. Nelson Mandela Bay is the mohair capital of the world as it is the city where the most mohair moves through on its way to either being graded, auctioned, processed or exported. I was very fortunate recently to get the opportunity to visit the three mohair related factories in Uitenhage that belong to the Stucken Group, namely Gubb & Inggs where the mohair gets washed and turned into tops, Mohair Spinners South Africa where the mohair is turned into yarn and lastly Hinterveld where some of the most luxurious and timeless mohair products anywhere are produced. I have a series of seven photos which I will post over the next week along with everything you need to know about mohair. After the goats are sheared and the fleece is clipped off, the mohair gets sorted into various lengths, fibre diameter and quality types. In the picture are the bales of mohair, already sorted, as they arrive at Gubb & Inggs before the process start. A couple of weeks ago I accompanied a journalists up the Donkin Lighthouse fairly early one morning and snapped this picture facing the King Edward Hotel and Grey Institute with the lighthouse's shadow stretching across the Donkin Reserve. A couple of fishermen fishing off the rocks at Schoenmakerskop with a bit of a rough sea beyond. On Saturday morning I bundled the family into the car and headed down to Retro-Pickers in Walmer. Around every second corner there is a coffee shop these days, but Retro-Pickers is something refreshingly different. 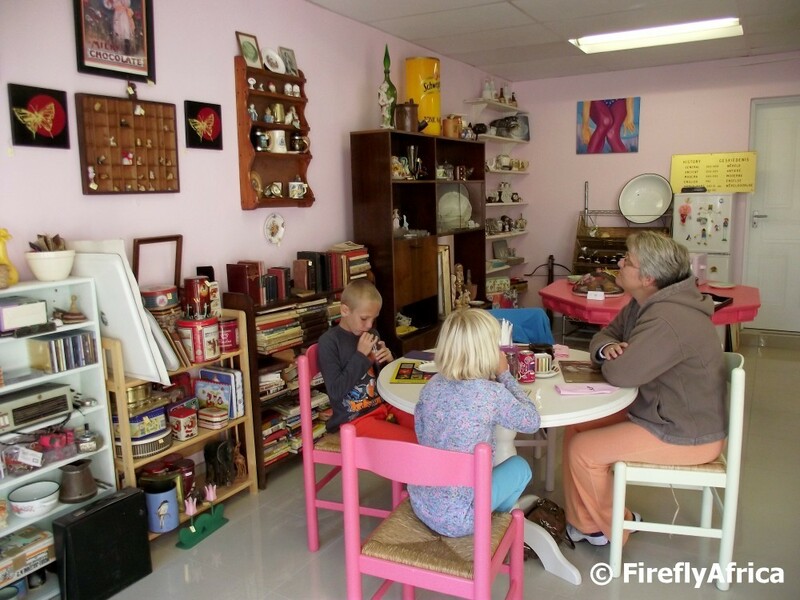 Imagine an antique shop selling mostly retro items and clothing combined with a small personal coffee shop and you will have Retro-Pickers. The coffee shop isn't very big with only three tables inside and another four outside making it a nice quiet spot to go for a chat and browse. I probably spent more time going through everything on the shelves than I did sitting at the table and every time I sat down my eyes caught something else and I was up again. The menu is nice and compact and we decided on the mouthwatering beef pitas. I also noticed that there is always gluten-dairy-sugar free Choc Chip Muffins at R12 each on the menu so anybody can visit for a coffee and snack. So next time you're driving down Main Road looking for a spot for a coffee break, do pop in at Retro-Pickers. On Saturday evening No7 Castle Hill celebrated Museum Week by having a "Night in the Museum" evening. Visitors could visit No7 after dark between 6pm and 9pm and with some of the lights turned off to gave it a very special atmosphere. Each child received a treasure hunt page with items found throughout the museum on it as well as a little battery operated "candle". Although I have been to No7 Castle Hill so many times before it was a great opportunity to go through it with my family and see it in "another light". 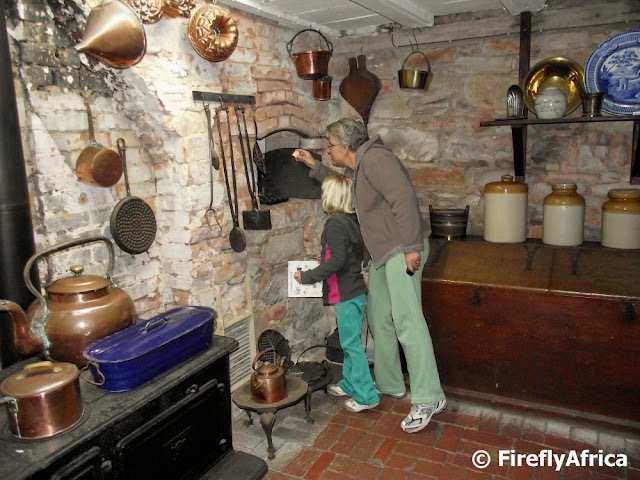 Here the Damselfly and Drama Princess checking out the oven in the old kitchen before we headed back upstairs for coffee and rusks. Standing on top of the Donkin Lighthouse and looking east towards Algoa Bay the new winding walkway leading up from the city centre is visible. The walkway is part of the Route 67 development and lately the skateboarders have discovered it and the fact that its a perfect downhill run. There has even been a submission to council to hold a skateboard competition there. I hope people don't mind me posting a pic about the little tuxedo wearing marine birds at SAMREC every now and then. 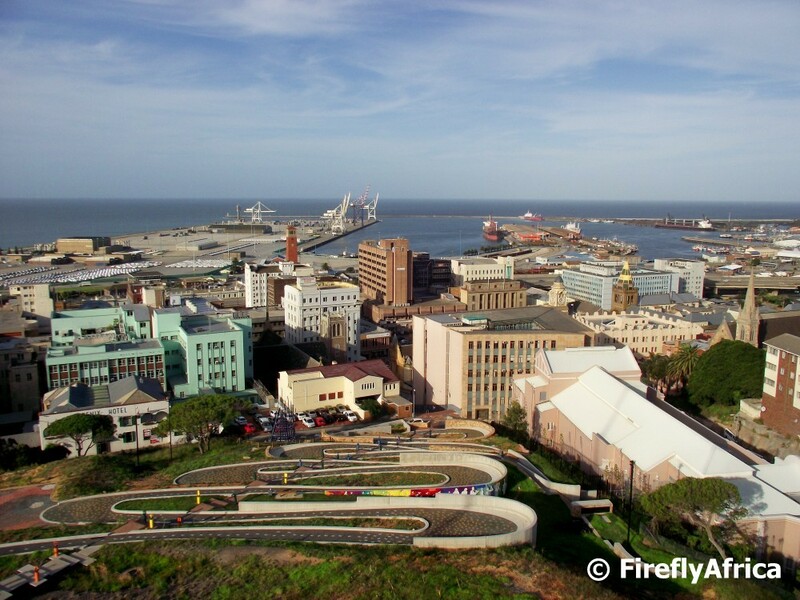 SAMREC is truly one of the attractions in Port Elizabeth that has a special place in my heart and they really do an amazing job. 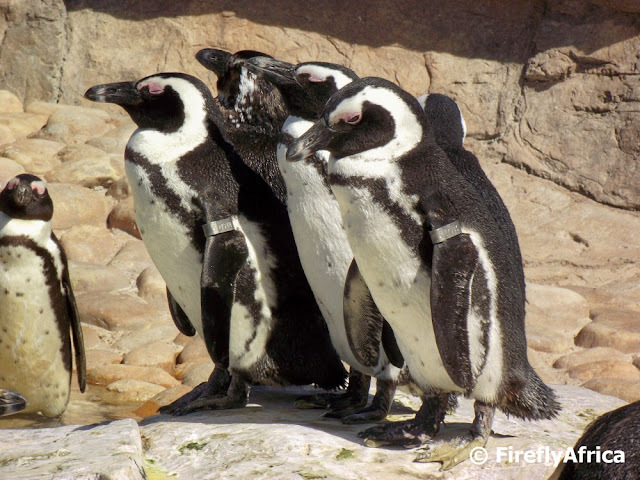 By posting about them I do my bit to create awareness for the protection of the African Penguins as well as the centre itself. 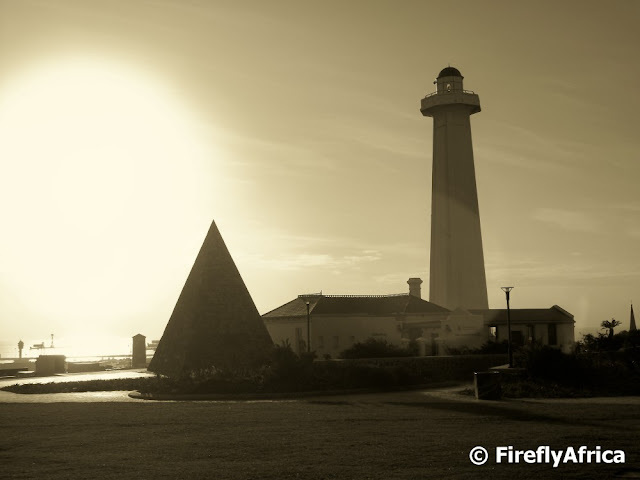 The Donkin Reserve is truly one of Port Elizabeth's biggest iconic sites with the lighthouse and pyramid standing side by side on the city's balcony overlooking Algoa Bay. 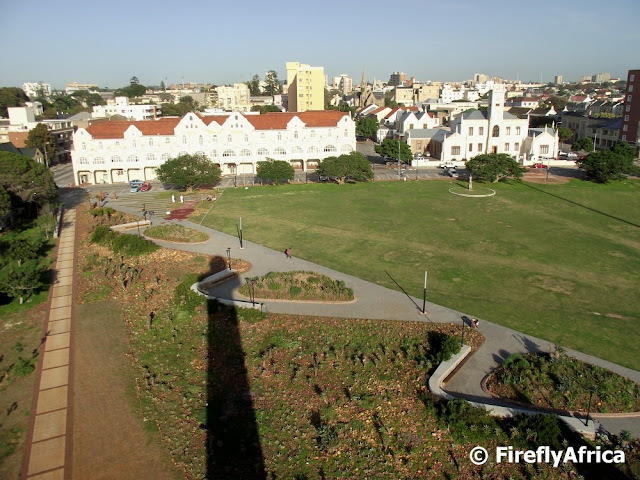 The other day a couple of us talked our way into the old Grey Institute building across the road from the Donkin Reserve. The building was bought by the Mediterranean Shipping Company (MSC) a few years ago and since then they have embarked on an extensive restoration project, turning it into their regional office here in Port Elizabeth. 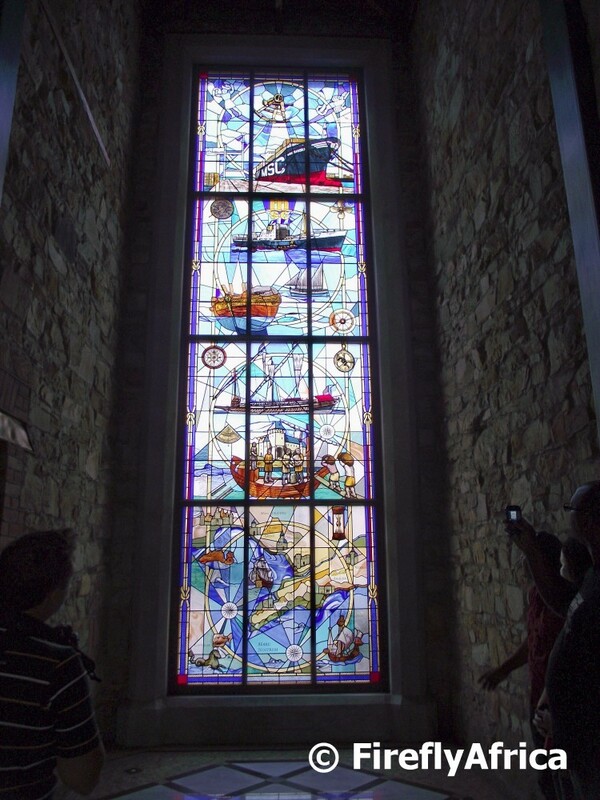 One of the new show case features in the building is a (guesstimating) four meter high stained glass window featuring ships from over the years. I'm not a big bug fan unless I'm looking at it through my camera, but if I had to choose my favorite spider it has to be the Golden Orb-Web Spider. 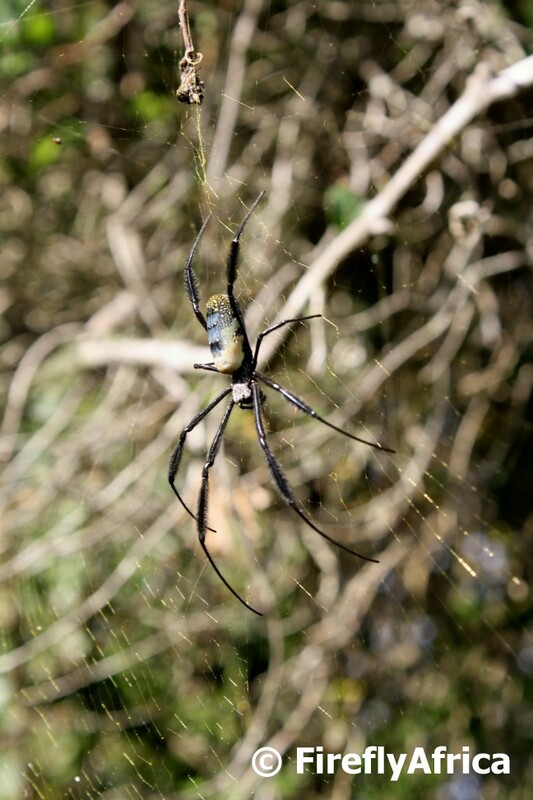 They get their name from the gold coloured web that they spin. I have seen them at Sleepy Hollow before and with this last visit kept an eye out for one as we were walking along the river. And I wasn't disappointed. 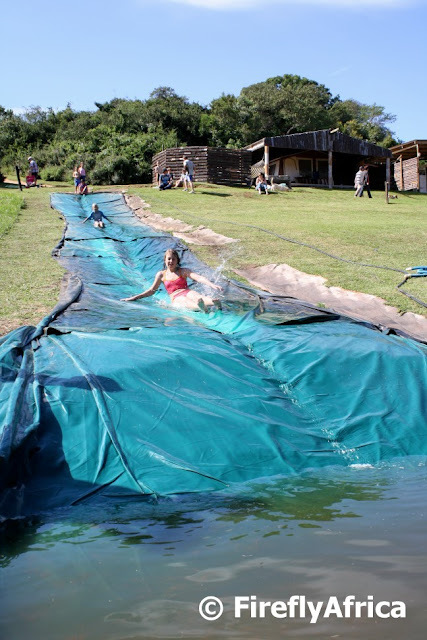 After spending two days going down the slippery slide with the kids at Sleepy Hollow my Boet and I decided to go and try out the foofy slide (zipline) at the main swimming hole. Now I'm not one who is very comfortable with heights and I get nervous if I have to lift my feet anywhere higher than mother earth herself. 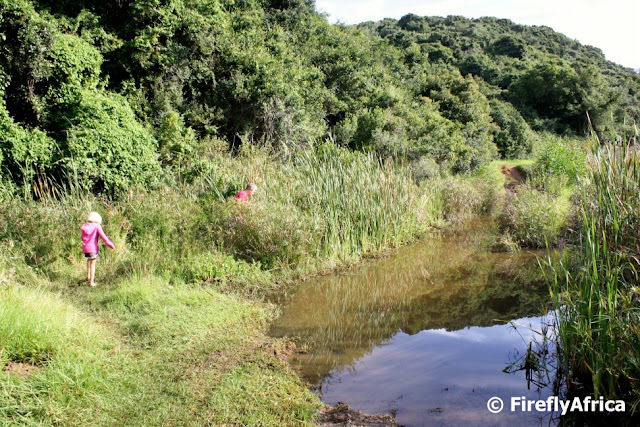 That coupled with the unknown speed of the zipline, submerged rocks next to the bank and... the worry of how long I could actually hold my own weight meant that it took a bit of time to get the guts gather my wits. 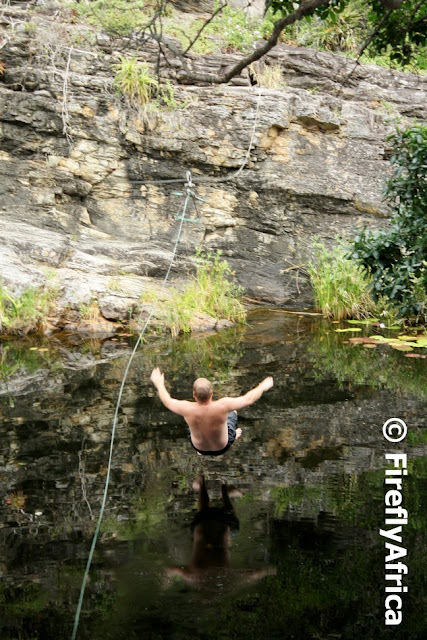 Then there was the need to calculate the wind speed and direction, zipline angle and everything else that I had to be sure of before zipping down the cable and letting go over the black (and very cold) water of the swimming hole. 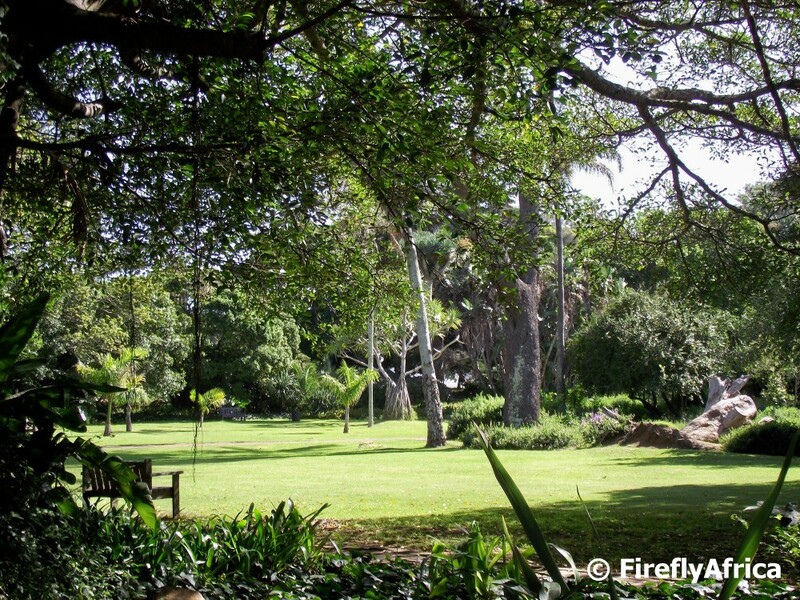 So in the picture you can see a flying Firefly just before the big splash. 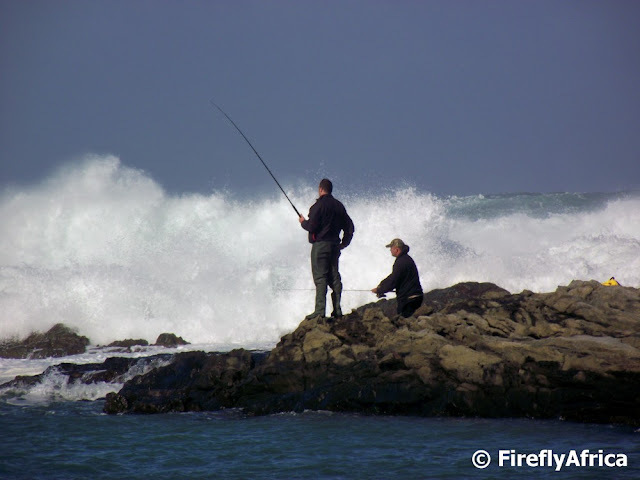 Oh yes, I just want to mention that I kept on going long after my Boet had decided to stop. My inner child crawled out again. I may be in my mid thirties, but I am very much in touch with my inner child who, every now and then, forces himself to the surface and refuses to crawl back in. So it happened at Sleepy Hollow where I went down the slippery slide before the kids even got their costumes on. After the kids had to stop and stood shivering I kept on going (and had the aches and pains the next day to remind me). One of the other campers said that it looked to her that I was really enjoying myself. You know what, when I'm sixty one day I hope I would be able to still do things like this with my grand kids like my grandfather did with us and I will still enjoy it as much as I do today. Some of the interesting features at Sleepy Hollow outside Port Elizabeth are a couple of old abandoned silver and lead mines that date back to the late 1700's. Although we did explore them on a previous visit, Chaos Boy wanted to go and have a look again. 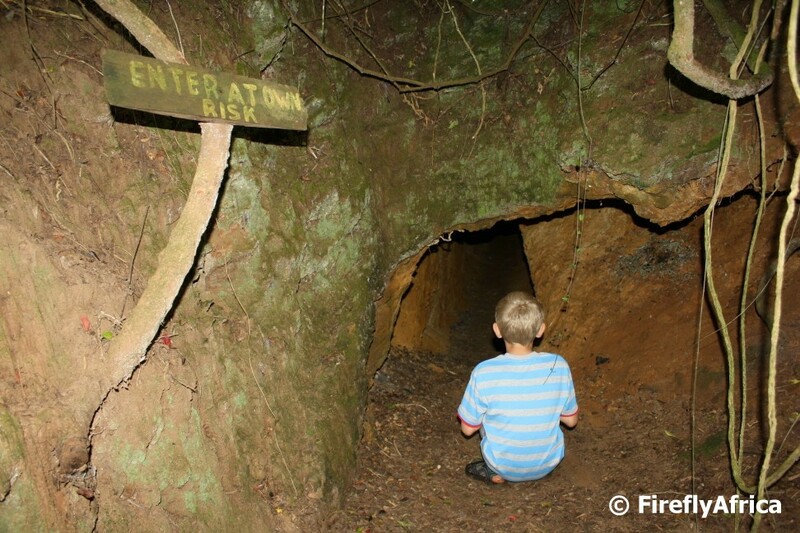 So off the two of us went one morning with torches in hand to explore the tunnels. The three tunnels go straight into the hillside with the longest one probably being about 60 meters or so in lenght. 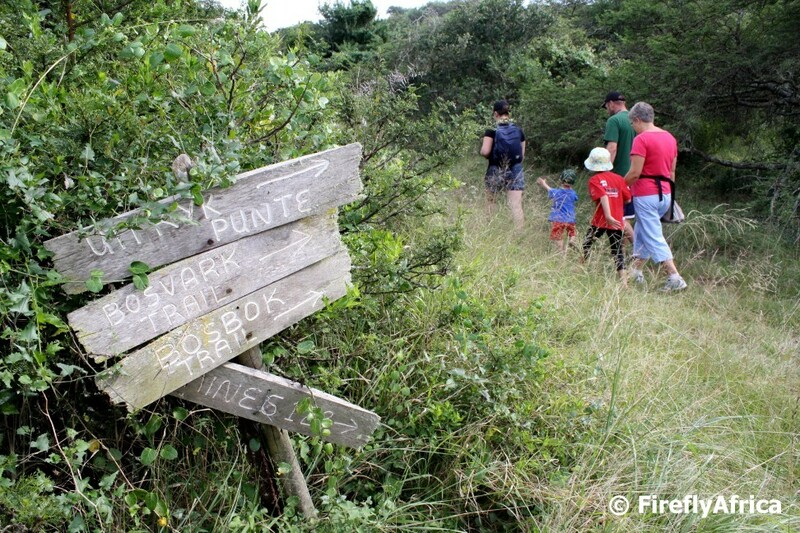 As mentioned yesterday there are several short hiking trails around the farm at Sleepy Hollow. 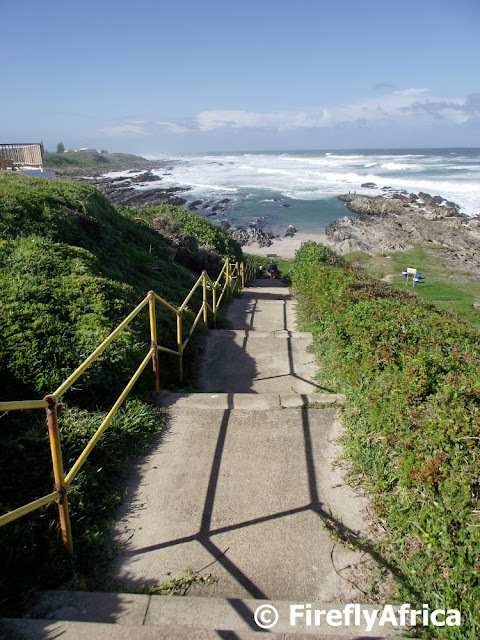 We did a number of them and on this specific morning headed out on the main trail, turned off past the old mines before continuing along the Bosvark Trail looping back down to the main trail. In total there are probably just over 5 kilometers of trails at Sleepy Hollow, one of which takes you boulder hopping up to a small waterfall. Sleepy Hollow is situated in the Maitland River Valley which means that the Maitland River runs through the property. Duh. That sounded better in my head before I typed it. Anyway. There are several trails that you can take with the main trail following the stream up the valley. Along the way the trail passes several pools while you have to cross the stream three times. This is Eerste Drif (First Crossing) where you can either walk through the knee deep stream or follow a (slightly muddy) path along the side. 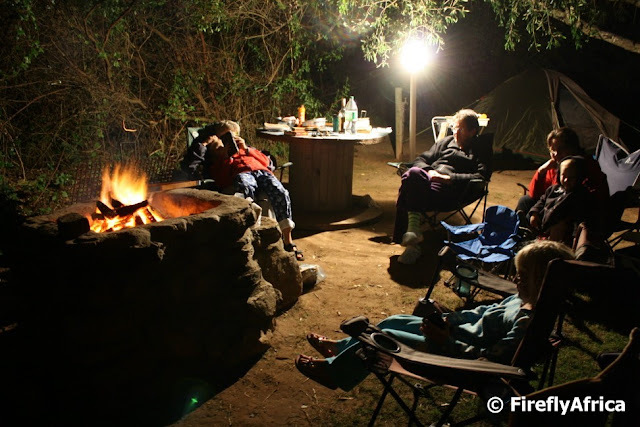 Over the recent loooong weekend we (we being me and my family - Damselfly, Chaos Boy and Drama Princess - my Mom and my Boet, his wife and kid) went camping at Sleepy Hollow just outside Port Elizabeth. I have done some posts about Sleepy Hollow before, but seeing that I have a bunch of fresh pics I decided to do a series of seven posts showing the sights and activities we encountered there. Sleepy Hollow is situated in the Maitland River Valley just off the Blue Horizon Bay Road and has a number of camp sites as well as covered caravans to hire in addition to the permanent caravans that are located there. Most of the permanents usually go out there over weekends so the best time to visit Sleepy Hollow is probably during the week as its much quieter. 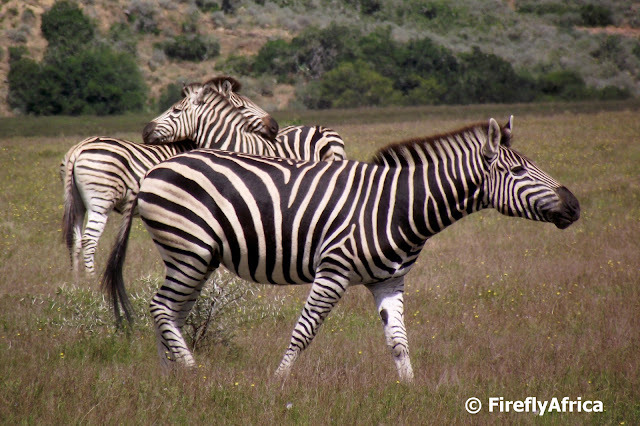 The Burchell's Zebra or plains zebra is the most common zebra found on the game reserves surrounding Port Elizabeth. Tourists just love seeing donkeys in pajamas and game rangers have so many stories, facts and jokes to tell about them. 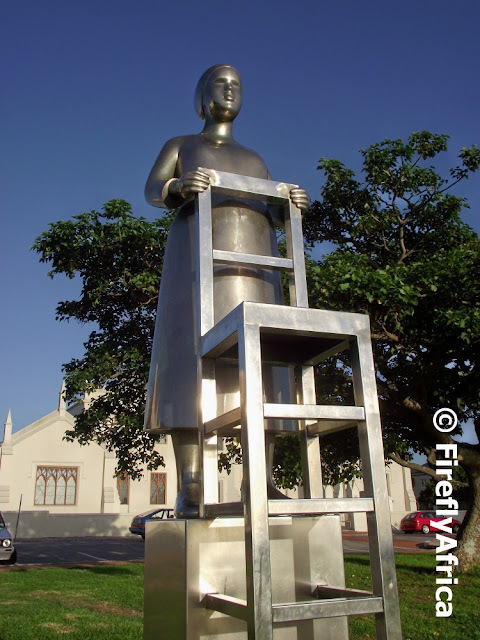 The unnamed conversation piece by Anton Momberg, or sommer maar net The Lady with the Chair, has truly become one of the landmark Route 67 art pieces on the Donkin Reserve. In 2009 Oscar the mix breed mutt was sitting on death row at the SPCA in Cape Town and had his lucky break by getting adopted one day before being put down. Since then Oscar has become the world's most widely travelled dog. He had travelled over 200 000 all over and around the world and has visited most of the world's well know landmarks, probably lifting his leg against most of them. Through his travelers Oscar is bringing the plight of all homeless dogs all over the world to the fore and helps to encourage people wanting a dog to rather adopt one from their local animal welfare organisation. 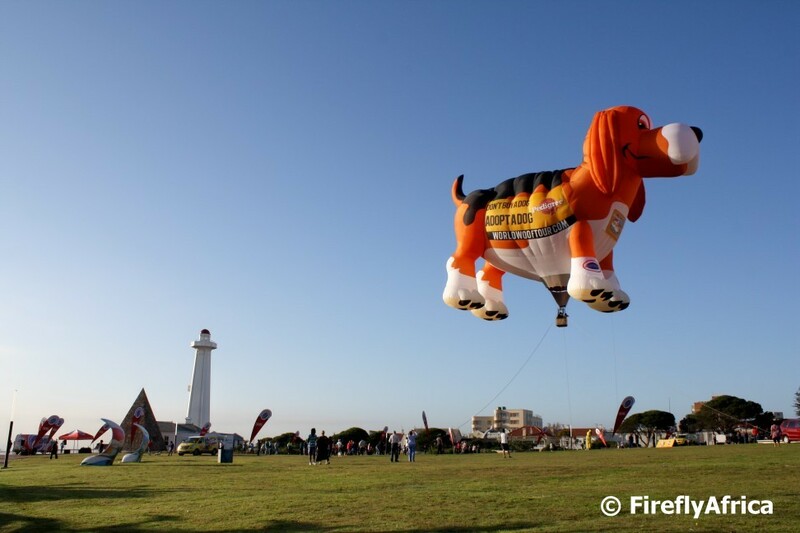 Oscar is currently travelling through South Africa along with Oscar Maximus, the world's biggest dog. Oscar Maximus, a 30m wide and 30m high hot air balloon, was floating above the Donkin Reserve this morning on their visit to Port Elizabeth. 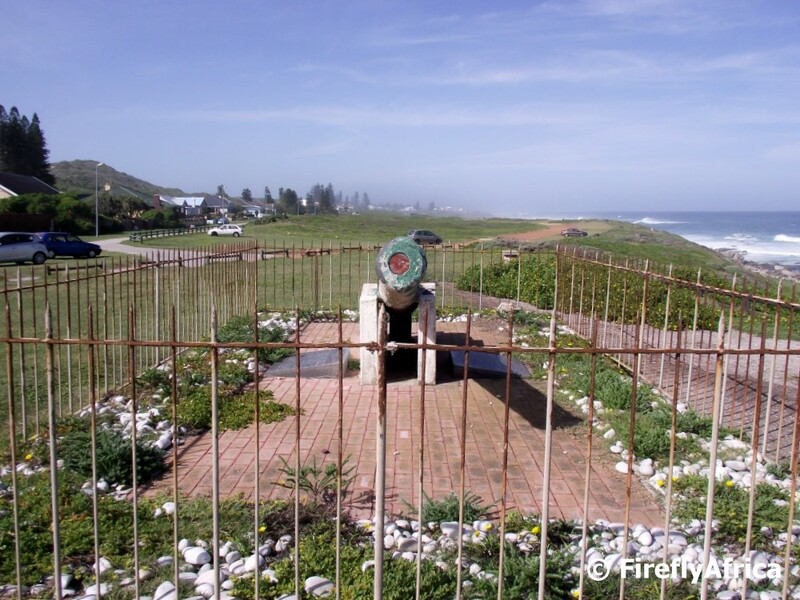 The brass cannon of the Portuguese galleon Sacramento, which sank close by in 1647, standing at the end of the road in Schoenmakerskop is a well known Port Elizabeth landmark and often gets photographed by both visitors and locals alike. I've taken pictures of it from the side looking both east and west, but this was the first time I actually took a picture looking at it straight on from the front. 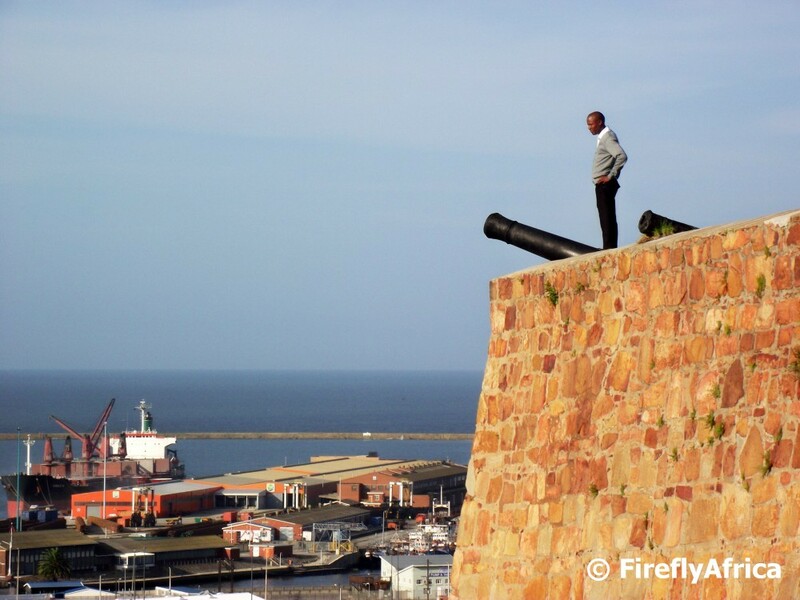 Stopping by Fort Frederick the other day I spotted this guy enjoying the view from the top of the fort's walls. Looking at the picture I wonder what it would have looked like with soldiers on the walls just after the fort was built in 1799. 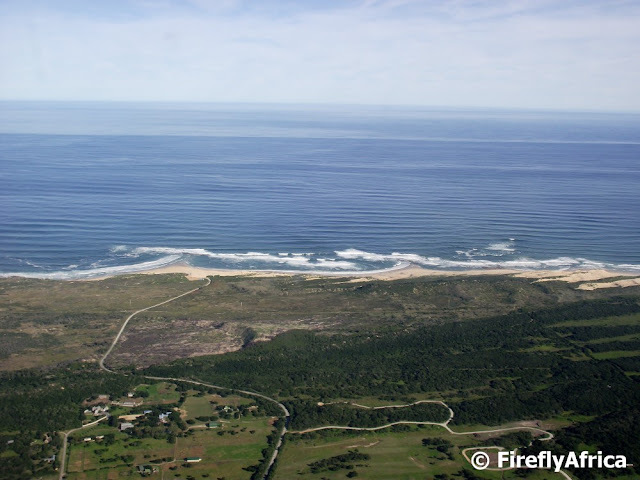 A week or so ago I did a post of a couple of guests at Amakhala Game Reserve enjoying the view of the Bushmans River Valley during their game drive. I thought I would post a picture showing the actual view they were enjoying. The recently renovated Athenaeum building in Central isn't an easy one to photograph. In the morning the whole front of the building is in shadow while the trees in front of it throws shadows on it in the afternoon. 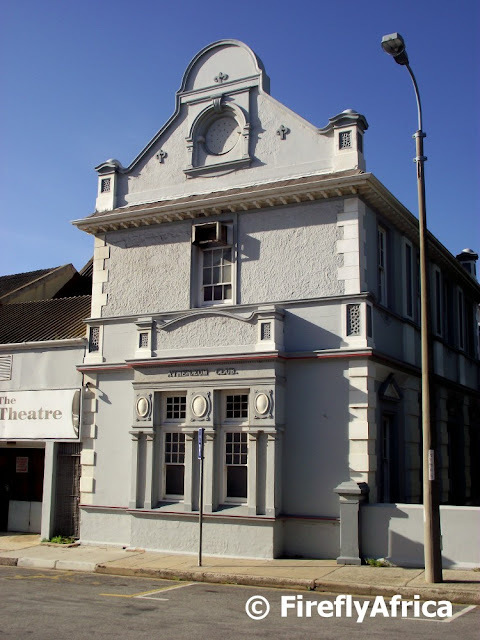 I did get a picture of the side of the building (right next to the Little Theatre) the other morning on my way to No7 Castle Hill which is just down the road. 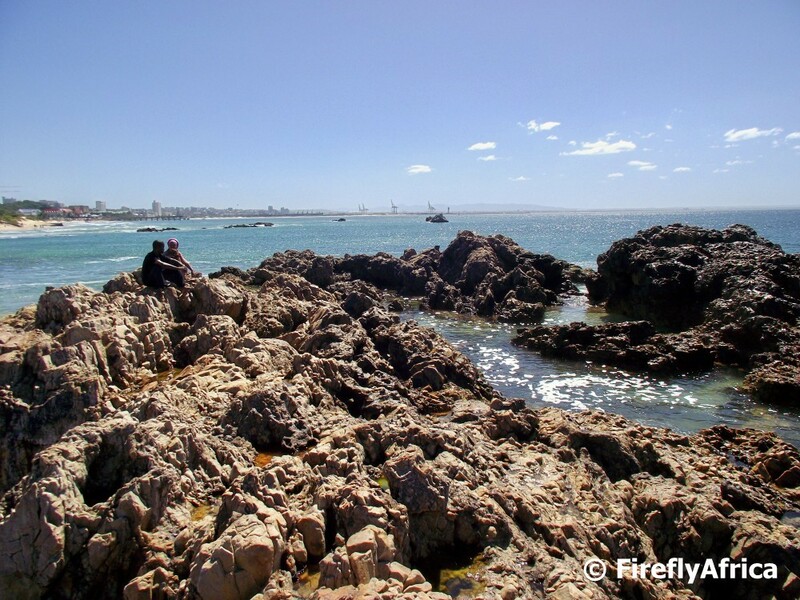 Oh how I wish I could spend the day sitting on the rocks like this and just stare out at sea. I did have a super relaxing looooong weekend, but now its shoulder to the wheel till after Tourism Indaba. The next two weeks are going to be seriously hectic at work so please excuse if the posts doesn't have a lot of information in them. If I did decide to slip away to stare at the bay, I would probably also do it here on the rocks at Pollok Beach. One of the new art pieces on the Donkin Reserve forming part of Route 67 is a 470m2 mosaic which is seen here from the top of the lighthouse. 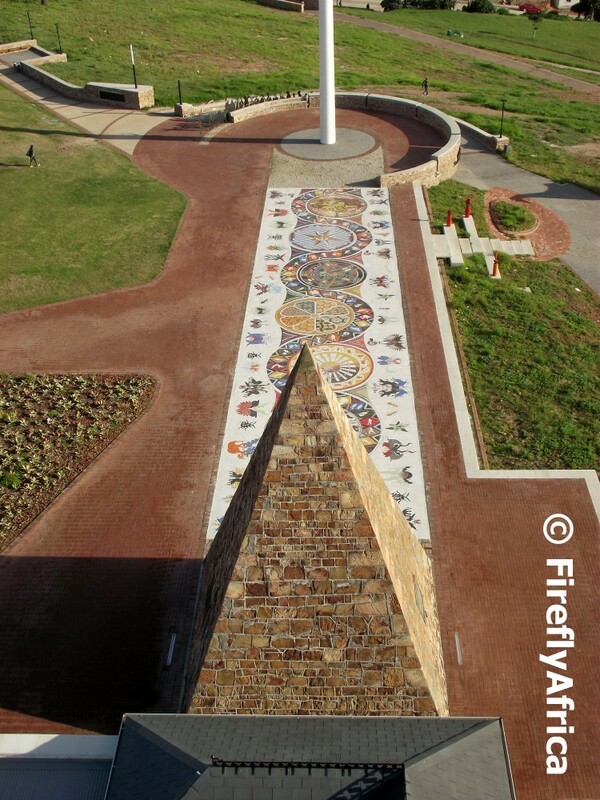 The mosaic represents the multi-cultural heritage, diverse history and the abundant fauna and flora of both the city and the province of the Eastern Cape.